At Trojan, our FCL Cartage service ensures your goods are transported quickly, cost effectively and securely across the country. Whether you’re importing goods from overseas, preparing for export or simply moving containers inter or intra state, Trojan has the technological solutions and experienced staff to efficiently manage your job. Our trucks are fully insured and manned by industry professionals to ensure every container is delivered on time and in budget. 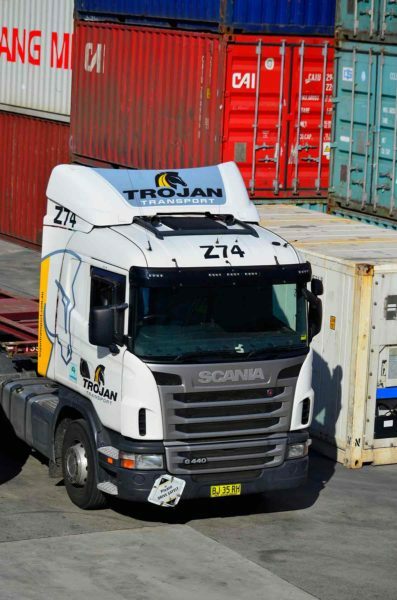 Trojan Transport’s world class GPS tracking system sets us ahead of the competition by ensuring you receive greater security for your goods, more efficient delivery, and significant savings. What’s more, it enables us to provide you with meaningful information about your consignment that will assist you and your clients with planning and managing stock. Using our on-line tracking system we can pin point and report the movement of your consignment as it arrives then departs each leg of its journey. But it’s not just tracking deliveries that makes our state of the art logistics management system a valuable tool for your business management. You’ll also have immediate access to your Trojan Transport statements, the ability to reprint any unpaid invoices and the opportunity to check on any stock you hold in our warehouse.